TSEA believes employees should not be divided into two classifications for pay and benefits. The first step in correcting this is to bring back longevity for all state employees. 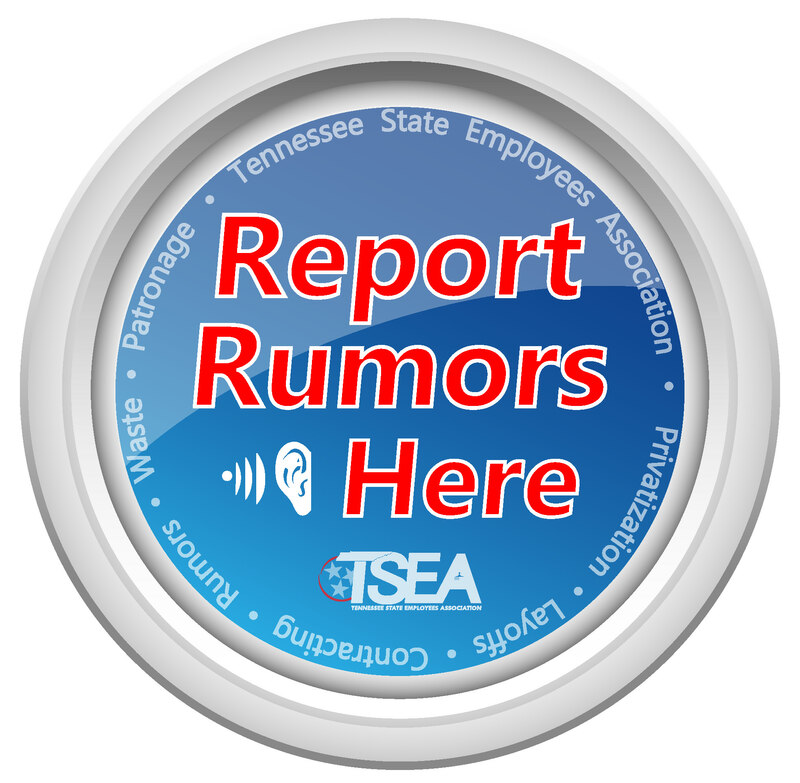 TSEA believes the State of Tennessee bears the burden of proof when they take disciplinary action against an employee that is appealable. This bill would clarify the relevant language in state statute. This bill requires the maximum caseload in some cases to be 20 instead of the average of 20, and 10 cases for foster care workers. Senate: 03/26/19 – Senate Judiciary Committee deferred to the first calendar of 2020. House: 03/20/19 – House Finance Subcommittee placed behind the budget. Will seek to correct deficiencies found in the application of the TEAM Act bill regarding several different areas of the preferred service section for employees. Senate: 02/11/19 – Referred to Senate State & Local Government Committee. This bill enables the Treasurer of the State of Tennessee to have input regarding the impact on TCRS from outsourcing state jobs. This bill addresses across-the-board pay raises. Senate: 02/07/19 – Referred to Senate State & Local Government Committee. Prohibits any executive level state employee, lobbyist or employee of a contractor from providing false information to the fiscal review committee. Senate: 02/06/19 – Referred to Senate State & Local Government Committee. House: 03/05/19 – House State Committee recommended with amendment 1 (004986), which adds the word “knowingly” to decrease liability for any executive level state employee, lobbyist or employee of a contractor that is unaware they are providing misinformation to the fiscal review committee. Sent to House Calendar & Rules. Daycare for state employees administered through their departments or institution. Senate: 03/19/19 – Failed in House Employee Affairs Subcommittee after adopting amendment 1 (005876). House: 03/28/19 – Set for House Public Service & Employee Subcommittee 04/03/19. Requires each institution governed by the board of regents or a state university board to make available on its website the grievance procedure for its support staff. Senate: 02/01/19 – Referred to Senate Education Committee. House: 01/28/19 – Caption bill held on House clerk’s desk. This bill deals with family and medical leave insurance benefits. Senate: 02/07/19 – Referred to Senate Commerce & Labor Committee. House: 03/19/19 – Failed in House Employee Affairs Subcommittee after adopting amendment 1 (005876). Grants a retirement allowance to surviving spouses who are designated beneficiaries if the deceased TCRS member is vested. Senate: 03/11/19 – Senate passed. House: 03/27/19 – House Finance Subcommittee placed behind the budget. Requires state agencies to produce an economic impact statement prior to entering a contract with a private party if either the contract is in excess of $2.5 million or the contract will result in the furlough or layoff of any state employees, instead of both; authorizes the chair of the appropriate standing committee to schedule a hearing to review the economic impact statement. Broadly captioned. Would require the court to sanction an employee for a frivolous suit. TSEA opposes this bill as introduced but have met with the sponsor to express our concerns and are working to find a compromise solution that will achieve the sponsors goals without affecting state employees. Senate: 03/19/19 – Senate Judiciary Committee recommended with amendment 1 (005007), which rewrites the bill and defines “public employer” or “employer” as this state or an agency or office thereof when considering public employee’s communication with elected public officials. Sent to Senate Calendar Committee. House: 03/28/19 – Set for House State Committee 04/02/19. Requires the board of regents, the board of trustees of the University of Tennessee, and the state university boards to create and approve a policy requiring public institutions of higher education to compensate adjunct professors at least $1,000 per credit hour taught. Senate: 02/07/19 – Referred to Senate Education Committee. House: 03/28/19 – Set for House Higher Education Subcommittee 04/02/19. Requires certain state agencies and political subdivisions prepare and submit reports to the department of finance and administration regarding the effects of and plans for reductions in federal funding. Senate: 03/28/19 – Set for Senate Finance, Ways & Means Committee 04/02/19. House: 03/18/19 – House passed with amendment 2 (005971). Requires the Tennessee School for the Deaf, together with the West Tennessee School for the Deaf, to establish a two-year deaf mentor pilot project to assist families and agencies in implementing bilingual and bicultural home-based programming for young children who are deaf, hard of hearing, or deaf-blind. Requires the department of education to evaluate the pilot project and report its findings to the education committees of the senate and the house. Senate: 03/06/19 – Senate Education Committee recommended. Sent to Senate Finance. House: 03/28/19 – Set for House Education Committee 04/03/19. Requires corrections department, in partnership with the higher education commission and the board of regents, develop and submit to the general assembly a report detailing the higher education opportunities available to incarcerated individuals. Broadly captioned. Senate: 03/28/19 – Set for Senate Education Committee 04/03/19. Expands the offense of indecent exposure by those confined in a penal institution to include offenses against staff members employed by the institution, including clergy, educators, and medical professionals. House: 03/18/19 – House passed. Requires the salaries of all employees of the general assembly to be reflective of percentage pay increases or decreases for members of the general assembly. Any adjustments occurring do not go into effect until the election of the next general assembly. House: 03/13/19 – Returned to House clerk’s desk. Prohibits a current early service retiree from changing to disability retirement. Makes other changes to provisions governing TCRS. Senate: 03/18/19 – Senate passed with amendment 1 (005138). Reinstates service credits and salary increases suspended during 2003-2004 and 2009-2010 for assistant public defenders and assistant district attorneys. Senate: 03/28/19 – Senate passed. House: 03/28/19 – Set for House Finance, Ways & Means Committee 04/02/19. Enacts the “Proton Therapy Access Act,” which requires health insurance coverage to cover hypofractionated proton therapy in the same manner as it covers intensity modulated radiation therapy under certain conditions, including patients being a part of a clinical trial or registry. Senate: Senate Commerce & Labor Committee recommended with amendment 1 (006727). Sent to Senate Calendar Committee. House: 03/19/19 – House Insurance Committee recommended with amendment 1 (005282).